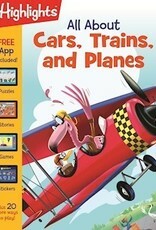 Highlights enters the coloring/activity book space with a dynamic and unique pairing of kid-pleasing activities and stories, plus a free interactive app. Kids will discover that transportation isn’t just about vehicles—it’s also about the sights and sounds of traveling that make it special. 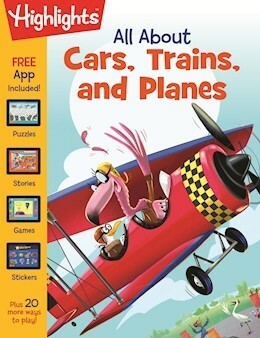 They’ll read about trucks and trains, puzzle their way to new places with hot-air balloons and planes, and tell their own story of adventure. Woven throughout each book are thought-provoking questions designed to encourage kids to talk and think more deeply about the theme. The free app extends the fun for endless play.